The secret to this oatmeal is the brand of grains my dad likes to use–Old Wessex All Natural 5 Grain Cereal (if using a different brand, make sure to check the cooking instructions on the packaging as they might be slightly different). 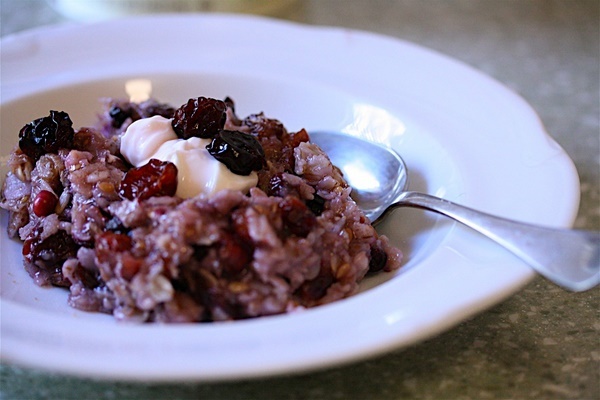 He likes to call this version his “city” oatmeal because you don’t need fresh ingredients to make it. His summer “Island” oatmeal uses fresh peaches and blueberries, while this one just requires frozen (which turns the oats a bluish color). But the true brilliance comes at the end of the cooking process, when he covers the pot with his bowl to warm it. In a small saucepan, bring 1 cup of water to boil. Slowly stir in the oats. Cook for 5 minutes, then add the blueberries, cherries, and an additional 1/4 cup of water (this will make the cherries plump up). Cook until most of the liquid has evaporated. Turn off the heat, and cover the saucepan with the bottom of your bowl (see above). Let the oatmeal rest for a minute. Then scoop the cereal into your (warm!) bowl, and top with brown sugar and a spoonful of Greek yogurt (if using). Enjoy.